The TDSB has a positive space initiative that is part of Ontario’s Equity and Inclusive Education Strategy. The campaign is one way we make our buildings safe, inclusive, and welcoming places that are respectful of gender and sexual diversity. This space will be identified by a Positive Spaces poster and will be accessible to the whole school community for private conversation and groups. One representative from each of our 600 TDSB schools has been trained as a Positive Spaces Representative. 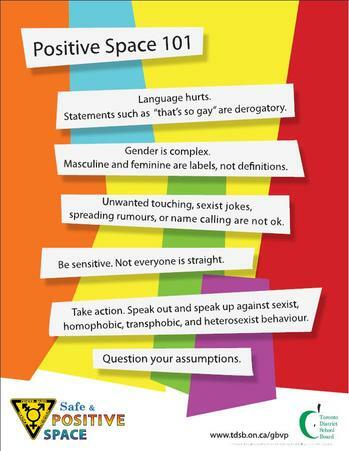 This space in your school is an area where staff and students can feel comfortable to discuss sensitive issues openly such as: positive sexual health, healthy relationships, sexual orientation, identity and expression, gender identity and expression. Up to date resources on sexual harassment, homophobia, transphobia, sexual health and dating violence will be easily accessible in this area of your school. Information on the creation of student-led groups such as: GSAs, equity clubs, young women or men’s groups will be made available in this space. Read our tips and strategies for handling harassment in your school hallway. Speak to your principal for information on the positive space in your school. Do you want to be a part of a student-led group? Speak to your principal to find out what student leadership opportunities there are in your school. For further information about how we support our students please go to Gender-Based Violence Prevention and Caring and Safe Schools.